In 2016, GetBackpacking! - GetGoing NC! 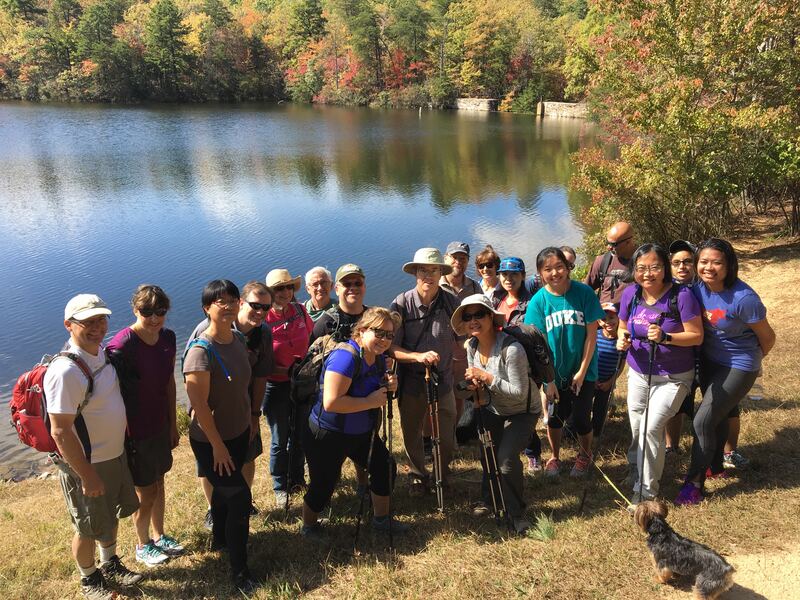 I had a hunch there were a lot of hikers-in-waiting out there and I was correct: today, the three hiking groups and a corporate wellness affiliate have about 3,000 members. As our hikes progressed, I developed another hunch: that more than a handful of those hikers weren’t content to leave the trail at day’s end and drive home. Frequently on hikes, I’d sidle up to someone and ask if they’d done any backpacking. The typical response: a look of bemusement followed by wonderment over why on earth anyone would willingly venture into the woods carrying 80 pounds of gear, including a leaky tent, cans of beans, hefty cast-iron skillets and who only knows what other Medieval tools of survival. Then I would explain how backcountry travel has evolved since the days of King Arthur. I’d talk about fast-drying ripstop nylon tents, ultra lightweight titanium cooking gear, sleeping bags and pads on par with any feather bed, and nightly meals of pasta primavera and turkey tetrazzini. I’d also mention that the typical load weighed closer to 30 pounds than 80. So last year we launched GetBackpacking!, a four-week program intended to turn the curious into the capable. Three weeks of training hikes, each focusing on a particular skill (gear selection and packing, setting up and breaking camp, cooking and endurance) followed by a graduation trip of three days and two nights at South Mountains State Park. Nearly everyone who began the program entered with a significant … concern. Elizabeth Lulich of Raleigh had never slept in a tent before, let alone in a tent in the backcountry. The notion was unnerving. Her first night she quickly embraced one of the joys of backpacking: drifting to sleep serenaded by the sounds of the forest. Susan Levy of Cary had a similar concern — and also emerged with a different perspective. Life on the trail is a life of simplicity, of focus. Food, water and shelter are your basic concerns — your only concerns — yet the essence of survival. Being immersed in nature can connect you with the world in ways unexpected. “I was very skeptical of all filtering systems, but I drank the filtered water and cooked with it and didn’t die.” Levy, by the way, went on to thru-hike the Appalachian Trail, completing the odyssey this fall. Some discovered that it wasn’t all that hard to spend 60 hours straight with relative strangers. Besides, on a backpacking trip you don’t stay strangers for long. Indeed, the disappearing American tradition of borrowing a cup of sugar is alive and well on the trail — sugar in this case being everything from filtered water to extra GORP to a place to stay should your tent not work out. Becoming self-sufficient is one of the big payouts of backpacking. Another: reaching places you can’t on a day hike. 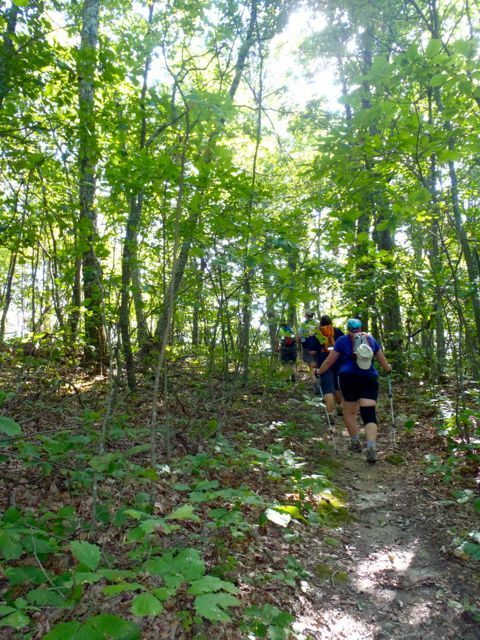 Technically, you could hike the entire 13-mile Black Mountain Crest Trail in one day, but it would be a very long day — and not nearly as much fun minus a night or two atop the Eastern Seaboard above 6,000 feet. Remote stretches of the Slickrock Wilderness, or Shining Rock, or portions of the Nantahala National Forest are likewise best enjoyed where they are least accessible in a day. To most of these newly minted backpackers, their South Mountains State Park trip was a revelation. 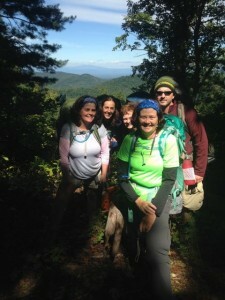 Yet in the North Carolina and Southeast scheme of backcountry adventure, from the Dolly Sods Wilderness in West Virginia, to Mount Rogers and Grayson Highlands in Virginia, to our own vast Pisgah and Nantahala National Forests, to the Great Smoky Mountains and the Appalachian Trail, South Mountains is a baby step into the woods. What: GetBackpacking! information session, covering what backpacking is about, how our program works, our four sessions scheduled for winter/spring, and wealth of backpacking opportunities in North Carolina. 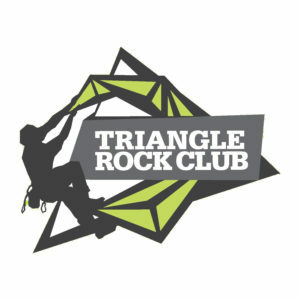 When: Tuesday, Jan. 19, 6:30 p.m.
Where: Great Outdoor Provision Co. in Cameron Village, Raleigh. To sign up: Visit our GetHiking! Triangle Meetup site, here. Session 1: January/February; Session 2: March; Session 3: April; Session 4: May/June.